Winter l Spring 61 A New Year, a New Look to Clearwater’s Long Center Aquatic Center Out with the old, and in with the new! The Doyle Aquatic Center at Clearwater’s Long Center is more bright and beautiful than ever after undergoing a $1 million makeover last year. The pools closed in June 2017 and reopened six months later in November. Upgrades were made below and above the pools, which included new hydrazzo decking, new tiling, pool resurfacing, new LED lighting and pump room/ mechanical upgrades. Visitors will also find newly added family changing rooms, separate from the existing locker rooms. “We feel this renovation has taken us at the Long Center from good to great,” recreation supervisor Richard Auskalnis said. “This allows us to offer the best facility possible to the citizens of Clearwater.” The renovations are not only important to members and athletes who use the pools to train and for competition, but they also are used to teach young people of all ages lifesaving swim lessons. All beginning swim lessons are only $10 per session; the city believes that cost should not be a barrier when it comes to preventing drowning, the leading cause of death among children ages 1-4 in Florida. Since opening in 1990, the Long Center has provided more My Clearwater than 29,000 swim lessons. “We want to save lives,” Auskalnis said. “Living in a water state makes it incredibly important that we educate all our youth on water safety. 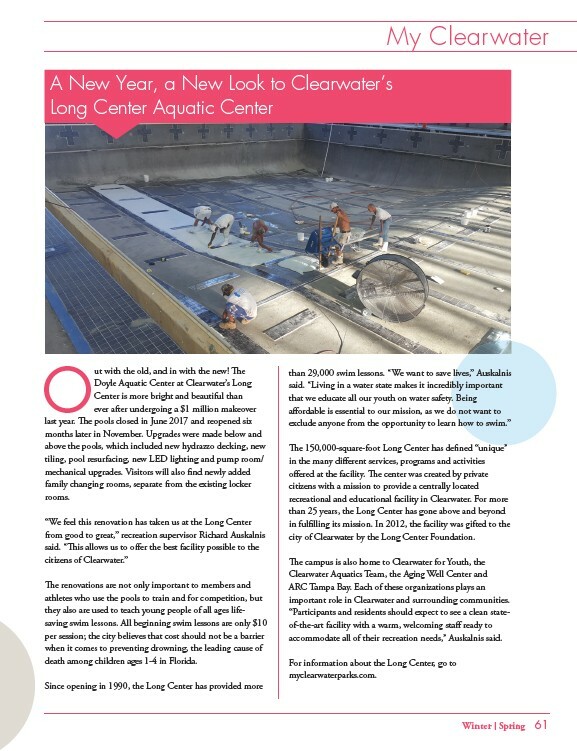 Being affordable is essential to our mission, as we do not want to exclude anyone from the opportunity to learn how to swim.” The 150,000-square-foot Long Center has defined “unique” in the many different services, programs and activities offered at the facility. The center was created by private citizens with a mission to provide a centrally located recreational and educational facility in Clearwater. For more than 25 years, the Long Center has gone above and beyond in fulfilling its mission. In 2012, the facility was gifted to the city of Clearwater by the Long Center Foundation. The campus is also home to Clearwater for Youth, the Clearwater Aquatics Team, the Aging Well Center and ARC Tampa Bay. Each of these organizations plays an important role in Clearwater and surrounding communities. “Participants and residents should expect to see a clean stateof the-art facility with a warm, welcoming staff ready to accommodate all of their recreation needs,” Auskalnis said. For information about the Long Center, go to myclearwaterparks.com.